Last night, we enjoyed the dream of Goldilocks. We didn’t have “Bad Julio” or certainly not “Good Julio”, but rather, “less than catastrophic Julio.” That was good enough. He gave up 3 runs in 5 innings because he was at 98 pitches. 4 K’s and 4 BB’s. With Mick Dundee’s chances on offense (“better than average”), and a pretty good ride through the rapidly revamping bullpen, that was enough. The 4, 1 inning bullpen guys were Carle, Biddle, Brach (welcome aboard), and Minter. Brach gave up an infield single. Minter gave up a solid single. Otherwise, no walks, no runs and no other hits. Ronald Acuna, Jr. and Freddie Freeman each hit solo home runs. Camargo had 2 hits and was in the middle of the offense, getting thrown out at third trying to stretch a double with 2 outs and, thankfully, Tyler Flowers scored just before the out. The big news was on the trade front. Adam Duvall coming in (with the news reports saying he will play left against lefties with Acuna spelling out Inciarte, so let’s see if Snit gets the message). We sent out Wisler, Sims, and Preston Tucker. 3 players that seemed hard to hold on to with (a) the pitching coming up and (b) the outfielder coming over. I have fixed Monday. The rest of you have to pull your weight for a change. Get ‘er done. Low average guy who doesn’t walk isn’t exactly the prototype, but he does other stuff well enough, and he can’t be any worse than Ender vs lefties. Plus, never having to see Wisler/Sims throw straight-as-an-arrow fastballs over the middle of the plate (that then go outside the park) in Braves uniforms again will be good for my health. Well, I am back from my week long retreat away from reliable wifi, so I will work on the Friday front. AA had a good Monday too. Now let’s beat the Marlins while the BoSox flog the fillies. A return to first place is ours for the taking. OK, time to start placing bets……. Of those my preference is for Wheeler, but I think that’s not going to happen – Mets smokescreen. After that Gausman. I would’ve thought the guys we traded for Duvall would’ve fit nicely in a Gausman trade, so I’m wondering if that’s less likely. Looks like we’re stuck with Flaherty as our LH bat off the bench. We don’t really have any LH bats at GW or MS to consider except maybe Rio. And Rio should be out with the next trade for a SP. I couldn’t find many appealing lefty bats that could really just sit on the bench and be an effective replacement for injury or merely PH. Maybe Grandy. Others include Gennett and Dietrich – those would be costly. I think Duvall considerably reduces the chances we’ll see Riley before September. I like Duvall for the bench. Hopefully, his arb figures in the offseason don’t force the Braves to consider him beyond a vs. LHP platoon. @1 What would be the over/under on full season ERA for Wisler or Sims as starting pitchers in the Great American Ballpark – 6? 7? I’d held out hope that Wisler would figure some things out in Atlanta and realize his potential as a #3 – #5 starter but that was, admittedly, a very low probability outcome. Now with Cincy, I think Wisler will get a nice long look to see if he can hack it at the MLB level… but I highly doubt he or Sims ever turn into anything useful. Seems to me that sending out Wisler and Sims is almost (but not quite) one of those “great trade, who’d we get? ?” moments. Neither were poised to do anything for Atlanta, they were clogging up spots on the 40 man roster and busy losing whatever small trade value they had left. Moving them for Duvall – a guy with plenty of shortcomings but who looks like a good fit with the 2018 Braves roster – makes a great deal of sense. FWIW, Duvall (career) is .241/.324/.473 vs. lefties and .231/.284/.461 vs. righties. Interestingly, his career average and power numbers don’t change with platoon advantage, but he *does* manage to walk enough vs. LHP to be productive and playable but not as a RHP. His defensive stats are pretty good, too, which means he isn’t limited to being a bench-only option. Seems like (as others have mentioned) his actual impact on the 2018 W-L record is a high variance matter… Duvall could pop a bunch of clutch homers and be this year’s Brooks Conrad, or he could whiff a ton and look like 2012/13 Dan Uggla. Duvall fits the team well in that he’s a right-handed bat and he’ll still be cheap through at least next year. He fits better than my Dietrich proposal. Really glad we were able to turn Wisler and Sims into something that actually helps our roster. That settles that debate. I wonder if the team looks at Duvall as a sort of project going forward. If he could look at a few more pitches, maybe he could improve his OBP. Hopefully his eyes aren’t getting worse. For anyone who doesn’t know, Duvall has type 1 diabetes. Tucker will hit a lot of homers in that park while giving back most of that value due to the low OBP and terrible defense. Sims seems like the kind of pitcher that takes 150-200 innings to get used to a level and then he’s fine. I suspect he will become a decent back-end guy in time. I have given up on Wisler, so he will make all-star team next year. @10 I don’t think you have to worry about Matt Wisler making an All-Star team. Odds aren’t bad that Lucas Sims has Jeff Locke’s career, with a bunch of innings scattered across a bunch of seasons, one of which actually happens to be reasonably decent. Or he could wind up with Matt Belisle’s career, where after being a discarded Braves farmhand he winds up as a consistently effective middle reliever. The possibilities are endless! It’s like we had a deceased relative’s cheap storage unit with two large bean bag chairs and a lefty scissors in it. Too bad we’re right-handed. We traded all that stuff to a rising freshman in college we know who happens to be a lefty for a righty scissors — and sure, we could’ve gone around the office asking co-workers to borrow a righty scissors and then just not give it back if we really needed to — but the real value by far is no longer needing to pay for the storage unit at all. My hope for this move to turn into magic is all bound up in Duvall’s hard-hit/LD% improvements driving a BABIP turnaround. Anything can happen in a small sample. But it might be that teams just know how to shift to him, though. So are the Braves done trading? @16 My uncle who is AA’s assistant says they are not done. Says something huge could be about to get done. Duval gives us a power bat and helps us with lefties. He also makes our bench better. Three things we really need. The three team Inciarte/someone from Cleveland/Harper deal is still pending. What Sam said. Sam is besties with my uncle I just learned. According to MLB Central, Braves are very much in on Archer. I am so proud. Stu for MVP. I just don’t have warm fuzzies about Archer. Is this a guy who can be a good #2 on a contending team? I think there’s a lot we don’t know about WHY certain guys perennially underperform their components. Since I obviously think that Javier Vazquez is a good comp for Archer, I absolutely think the answer to your question is yes. That said, I’m no scout, and I’m sure that the Braves have instructed their advance scouts to try to figure out exactly what the answer is. I’m fine with moving any prospect not named Wright or Pache for Archer. Pache’s upside is massive and Wright seems poised to fill a rotation spot by next year. Archer isn’t an ace, but there are only a handful of those guys anyway. Replace his starts against Boston and NY with Florida and the Mets and he’ll have numbers that resemble one. I would make the Mets say no on Jacob deGrom before I got Archer. Smitty, the Mets have good reasons to not want to move deGrom. I think they’d accept nothing less than our top 4 prospects plus a little something else. I can assure you, if not formally, the Braves have made some kind of offer that the Mets have said no to. In fact, I’m confident the Braves have pursued every single cost-controlled starter that has been publicly mentioned or not. AA has earned the benefit of the doubt that the bushes have been sufficiently beat. We were not publicly connected to either three, and here they are. And I believe the reports that we’ve been connected to all these other players. So as it sits with 3 1/2 hours to go, the Braves have replaced Sam Freeman, Michael Reed, and basically Peter Moylan (at some point) with Venters, Duvall, and Brach. Those 3 had negative value, and with now having positive value, that’s a big swing. I see Flaherty being replaced with a better option, and those are the end of the slam-dunk moves. The “Archer is Teheran” fuego takes on Twitter are some of the best free entertainment the internet provides. I think we have to get another starter. This rotation isn’t getting us past LA in October. I’d be shocked if Flaherty is let go. I think that Archer could benefit greatly from a change in scenery, though. He has good components but has seen a sharp rise in hits. The Rays combined team DRS is, I believe, 7. The Braves have a combined DRS of 43. I think our defense could help him out a lot. So… I was happy with the Duvall trade for a few hours, until I read that the Cardinals traded away Tommy Pham to the Rays in exchange for 3 prospects, the highest of which was #14 in the Rays’ system. Tommy Pham would have been a great pickup for the Braves, and obviously the Braves could have topped the price the Rays paid without a noticeable dent in the farm system. Please note – I’m not actually unhappy with the Braves’ trade, just envying the Rays for acquiring a better right handed OF than we did. This guy’s post included a fake link to a Stark tweet saying we traded for Archer. We have enough trolls around here, good sir. Well, as soon as I can figure out how to ban people, that guy is banned. I’m looking for Touki to be called up to bolster the bullpen. Having said before that I don’t see Archer as a #1 and would not like to see the Braves trade the whole farm for him, he is a solid ML pitcher and does provide endurance and high end K rate. He could be better maybe with a better catcher or some tweaks in his pitch selection or something. He would be a positive asset to have; just not my choice for a #1. If he is the best we can get for a reasonable cost then I am OK with it. TT was offering up Fried or Gohara and Wright or Anderson and I think that is too much. I could accept headlining with Gohara but then including Wentz/Muller/Wilson as the second. Then a couple below that. No way I could accept two of our top five prospects in that deal. I might go as high as Anderson in place of Gohara but never both. I’d give a good part of the farm for JT Realmuto. We have a clear need at catcher maybe this year but certainly as of next season. You gotta go after him hard. Gohara, Anderson, Pache. Bowden saying we are emerging as favorites. The longer this goes on, the more a Gohara-headlined deal for Archer makes a lot of sense. And if the Braves trade for Archer, I’m confident that after seeing the lack of prospect trading we’ve done so far, I’ll be ok with whatever AA decides to deal. At this point, you just have to trust that AA has had enough time to decide which pitching to trade and which to keep. To follow Bowman’s analogy, if Gohara was acquired for 25 cents on the dollar, then I like that they’ve teased it out to find out if he could be the full dollar to ultimately sell him for 75 cents on the dollar. If only they could have done that with another previous top 100 guy like Wisler. Little disappointing that the Gnats haven’t made a sell-off move yet. Phillies are deep on Wilson Ramos. Two contenders, three sellers in the NL East. Realmuto would be obviously best acquired in the offseason unless you could make a separate deal to trade one or both of Flowzuki, which would be difficult. Flowzuki is found money, but this offseason we’ll be in the market for a catcher. The Nationals appear to only be moving rental players, and it seems they’re not even sold on being sellers. The deadline is going to pass and then down the stretch heads will begin to roll in that organization. They’ve botched the trade deadline if they were told to be sellers. And if the Braves trade for Archer, I’m confident that after seeing the lack of prospect trading we’ve done so far, I’ll be ok with whatever AA decides to deal. At this point, you just have to trust that AA has had enough time to decide which pitching to trade and which to keep. Agreed, Jorts. As of today, the man has improved the bullpen twice and acquired a solid RH power bat off the bench while giving up NOTHING that the team was projecting as part of their 2019-forward plan. NOTHING. If he gives up Gohara for a cost-controlled Chris Archer, I’m keen on giving him the benefit of doubt on it. It looks like the Marlins will deal Dietrich and Bour. Could you possibly think of a better first major league start for Allard? A gutted Marlins at home? Man, good for that guy. Bowden has clarified that his source has stated there is no clear favorite for Archer after all. The Rays continue to drive up the price. The Rays management are doing their jobs. There’s no reason to be upset with them for using their position of having a sparse good (young, talented, controllable starting pitching) to increase the market cost for that one time sell. If it were the Braves selling Archer for prospects, you’d want them to do the same thing in reverse. I’m not upset at the Rays. I’d just love to see us slam the door on them. There is such a thing as holding out too long. Sometimes when you attempt to play buyers against each other, they buy elsewhere and the other buyer(s) are no longer offering what they used to. So the Braves appear to be the most aggressive to go after Harvey according to MLB Network. I don’t know if I like that. Can we get both Archer and Harvey? Hopefully the threat of dealing for Harvey will spur the Rays to a decision soon. Really not interested in Harvey, who inspires no more confidence than Fried or Gohara do, so I hope Heyman is right. A big “no” to Harvey unless he’s another freebie. Or comes with Iglesias or Hughes and/or Gennett. It’d be even better if we were the ones getting Dietrich. If I could get Harvey for peanuts, he might be worth taking a chance on. There is talent in there, IMO he needs to get in shape, rededicate himself to his craft, see a psychologist and basically decide how much he loves baseball. If the Braves think they could provide or facilitate that, there are probably worse players to take that gamble on. Low risk, somewhat high reward. Bryse promoted to AAA. I think that means either of Fried or Allard is on the roster to stay – maybe both (I do think Allard will be rotated with other AAA SP). Harvey has been more valuable in his time with the Reds than Teheran has been. That’s about the best I can say. He would be a perfectly cromulent 5th starter with upside, which is what I used to say about JT. Yeah, Harvey isn’t really much better at this point than Fried, Allard, Touki, Gohara, and Wright. I can’t really imagine giving up much of anything for Matt Harvey. I know he would flip out, but I’d like to use Harvey as a multi-innings reliever. @64, Yup. People who applauded the incremental improvement of Duvall over Inciarte should in theory be ready to applaud the incremental improvement of Harvey over Teheran. I’m old enough to remember the Shelby Miller trade…wake me up when we trade for Archer or when Allard’s ready to start. 63 — Looks like Fried has earned the chance to stay up. I think he is in the 5 man rotation. 68—But they’re not getting rid of Teheran. It’s the lack of incremental improvement over the younger pitcher who will be demoted in favor of Harvey that inspires no confidence, even from someone like me who appreciates the Duvall deal. I will say, in every non-game photo of Kolby Allard I can find — and in most action shots too — he looks like someone who is somewhere in the process of farting and then trying to blame someone else for it. I like him already. Even if no more moves are made, I’m deciding to be OK with this deadline and put my trust in AA. He basically got a pretty good LOOGY+, a former/part time closer who’s made an all star team and a RH potential power bat who’s not that good at defense. With giving up literally almost nothing. It makes me think that when we are ready to actually give up *something* that we will be really happy with the result. I have bought into the Archer angle, with better defense, a pennant race, a non dungeon ballpark, not facing the Yankees and Red Sox every other day mantra. If he could just go 7+ every start and post about a 3.80 FIP I’d be fine with that. I would support the acquisition of Matt Harvey if the Braves exclusively planned to start him sitting in a dunk tank. But not on the mound. Public service announcement that the Furcal Rule is still in effect, and you should believe 100% of nothing about any of the rumors about who is “ahead” in conversations. Hey, when Chief “They’re not really trying to win”(TM) Nocahoma is OK with the deadline deals the team has made without giving up much of anything, that’s saying that things are actually looking up. We now know enough about the deadline activity to know that the GM is heavily engaged in his high stakes game of gambling. I, too, believe that when we finally let go of something of value, we’re going to be happy with what is being acquired. @70, If they’re not demoting Teheran, then yes, there’s not much of a point to a Harvey deal. Or I guess we think Fried can’t get his walks under control? A pennant race isn’t a great time to learn on the job. Reminds me a bit of the days when Rob or whoever would write dissertations about how all the C-prospect swapping was going to work out hugely in our favor – e.g. Whalen and Gant and Demeritte and company. This deadline is similar – much ado about nothing. But…there’s still time. If we don’t make any other moves I’m good with it. He didn’t massively screw anything up, which is really all I’m worried about. Matt Harvey would be on Kelsey Wingert like white on rice. Somebody’s gotta step up and criticize these namby pamby half-measures! Adam is doing a fine job of playing the heel. I kinda want to troll as it’d be pretty easy to dynamite this pond today, but…our fearless leader is dropping the hammer apparently! I suppose the krussell take is true to form because we were DOOMED from the start and nothing matters anyway. I’ll accept it! So far, all we’ve done is trade money we couldn’t use for a guy whose arm had to be gorilla-taped back to his body, a guy who has yet to throw an intentional strike this year, and the wrong Adam D.
We might as well start a team fire sale at exactly 60 minutes till the deadline! I mean, nothing *exciting* has happened yet, but everything that’s happened (trading a handful of nothing for a handful of something) has at least been *encouraging*. Nothing AA does ever leaks out to the press unless he wants it to get out. If the Braves have anything to do with Harvey or Gausman, it’s to spur the Rays into not waiting us out too long. krussell is the same guy that complains when Ender is OPSing .516 against LHP and will be happy when Duvall is starting in his place. And that was made possible by packaging a bunch of C- filler to get Ender’s replacement. Can’t have it both ways. The problem is that a lot of the liquidation of the C- filler was lost in the weeds. No one cares when you trade for Jaime Garcia in a non-contending year. How would you feel if they landed Garcia or his value equivalent today for 3 C- guys? You had to get them to trade them. I agree with the distinction between “exciting” and “encouraging”. You can get 3 WAR by improving 3 roster spots by 1 WAR apiece or you can do it by getting one 3 WAR guy. All things being equal, it’s one and the same. Braves firesale kicks off in 15 minutes unless they acquire Archer! My preference is Gausman. Maybe all the Archer talk is to get the O’s to move off the dime. So far, the O’s haven’t traded anyone they didn’t “have to” trade. Gausman is different and could get the O’s wobbling again. And giving Gohara or Allard or someone like that to the O’s and their medical team could be unnerving at best. Any way the O’s can review medicals in an hour???? The O’s appear to have a deal in place that doesn’t involve Jones — teams are reviewing medicals. No idea who is involved or even who the other team is. Gausman would provide some certainty considering Gohara is weeble wobble, Fried has blisters, and Allard might get swallowed by a rip tide. If we can get him for minimal, he would be nice Anibal-turning-into-a-pumpkin insurance. @85, we are replacing Ender’s LH AB’s with a guy that’s having an equally horrid season. I mean it’s a decent buy-low move and it has upside for sure, but let’s not act like we just got a sure thing. The real improvement hinges on Allard and Toussaint, assuming they are still in the org later this afternoon. Stable is one kinda way to describe Gausman. Braves firesale, barring Archer trade, beginning in 60 seconds……. Less than 1 hour remaining… sounds like the Braves are poised to acquire a starting pitcher, but who? I’m excited to watch him pitch, but Kolby Allard makes Wiley Wiggins look like Matthew McConaughey. If the Braves acquire Gausman, would he really be considered an upgrade, even to stability, over our collection of nearly MLB-ready prospects? I’ve looked his numbers over a couple of times, and I come away with the same conclusion that he is destined to be a #4 or 5 starter. Is there some upside potential he hasn’t yet reached, or is this the guy? Sounds like it is Gausman and Archer to the Pirates. 2:16pm: The Braves have been in contact with the Orioles regarding Gausman, tweets Ken Rosenthal of The Athletic. Heyman tweets that Atlanta has been “working hard” to add a controllable starter. This guy gives up home runs like he’s pitching the home run derby. What am I not seeing in his numbers?? @102 My bet is on Archer to the Pirates and Gausman/Schoop to the Brewers. Braves get skunked. Gausman is better than you think. Two years in a row he has pitched like an ace after the All Star break. He is durable, reliable. He will also benefit from a defense improvement. I haven’t looked at numbers but I bet he’s got ace-like numbers first two times through the lineup. He may go full-on Folty for an inning. I agree. maybe our scouts found an issue in his delivery or something. Phillies just got Loup. You know Kapler is going to bring him in every game vs. Freeman. Nervous just thinking about it. Look at Freddie’s numbers vs lefties. Bring it. Gausman! Yes!! I hope it’s not too expensive (fingers crossed). Regarding Gausman: he’s also had a pretty big drop in velo this year vs. prior. All pitchers are a risk, but there are some flags there. Okay, Kevin Gausman is genuinely interesting. @109 – It’s more around the guy breaking his wrist again. Gausman is making $5.6M this year, and then two more years of arb. Maybe $8-9M next year? Interested to see who they gave up. The logic that Brach would improve with our defense could also be applied to Gausman. Yep. Roger, you’re right that for his career, Gausman has come to life in the 2nd half with borderline frontline starter stats. He is not who I would have wanted, but I do have to admit that Archer isn’t having, really, a far better season, and so the asking price on Archer is likely just too much. Reed optioned to make room for Duvall. Who goes for Gausman? They’ve got 7 starters that need to be on the 25-man? Do they get time to let Allard make his start and then option him? Gausman has pitched much better on winning teams. Rays took back Glasnow, Meadows, and someone else. Once again, it seems like the Rays preferred lower ceiling, higher floor, closer to the big leagues players like they did in the Longoria deal. If Gausman’s 2nd half stat history carries that will do very nicely as he is a borderline ace in 2nd halves as noted above. Glasnow and Meadows… can see why the Braves didn’t get Archer. The question remains, Who did we give up? I’m betting Gohara is the headline of this deal, hence the medical review that is taking forever. Glasgow and Meadows is a steep price for Archer, IMO. Glad the Braves passed on that. The Orioles are notorious for the insane level of scrutiny in their medical review process. I understand the potential of Glasnow and Meadows, but c’mon, Glasnow can’t throw a strike. They could have extracted more cumulative upside taking back more players with equally high upside that are farther away. But the Rays can’t make those deals with their situation. Gausman immediately becomes our #3 – O’s treated him as a #2. He also becomes the senior member of the rotation (that’ll be new to him) not counting Sanchez. If he gives us 6-7 innings consistently keeping us in games and eventually gets displaced by the up-and-comers, I think that would be an excellent value Remember that our best pitching developers came over from the Orioles. Gausman has a higher ceiling and could easily turn into a Folty. Archer is clearly better than Gausman. Ugh…I need to know right now who we gave up so you guys can tell me how I’m supposed to feel. Roger McDowell is our mole who told us who to trade for. Wait a minute…. what if the Braves add Schoop? Brewers are in on Schoop. He pitches for an awful team against the beastly lineups of the AL East. I’d take his traditional stats with a big grain of salt. Who goes out? We gonna have a 7-man rotation? Maybe we gave up Sam Freeman, Peter Moylan and Luke Jackson. If so that would be one of the top 10 trades in Braves history before Gausman ever throws a pitch for Atlanta. I think Fried to the pen. Oh, I didn’t realize that’s where McDowell had gone to. Well that completely excuses Gausman’s 2017-18 seasons so far. We got us a steal, boyzzzz! I love how Teheran is now the comp for every pitcher someone wants to disparage. Gausman is better than Teheran. Bowman has 3 prospects for Gausman. 23 strikeouts in his last 43 innings .. not a power pitcher .. loosing velocity …. maybe we ship him with the other loosers for a AA prospect ……. Cumberland came from the pick we got for taking Matusz. Full circle. Tad is starting to look less like a moron and more like a troll. I was wrong, Archer is appreciably better than Gausman. Oh well. Can’t win them all. At the end of the day, I am just glad we were buyers, didn’t completely give up and at least did something. Gausman’s second halves are historically better than Archer’s full seasons. Who knows. when do we get to see this #5 hole pitcher pitch .. right behind our other #5 Teheran ….. I can’t believe TAD named some prospects. More stunning than the Chief face turn IMO. At my most obnoxious I am not TAD, LOL. Oh, c’mon guys. Tad is just saying what a lot of us are thinking when we look at his season so far. Based on his 2nd half splits for his career, this guy could definitely emerge as a much better pitcher if he ever put it together in the first half. Cumberland, Evan Phillips and Bruce Zimmerman? @156 if that’s true, we did well. I’ve been telling you Tad’s not worth it for a while now. I guarantee you Freddie Freeman and Nick Markakis value Gausmann and Duvall’s arrivals. The simple fact that your management team goes out and gets you an established ML player rather than throwing another rookie debut at the middle of a pennant race, matters. I also have a confession to make. I’ve added Strat-o-Matic to my baseball obsession and I’m having so much fun with it. Between my OOTP, fantasy baseball, and Strat-o-Matic I’m enjoying this year. And as much as I am TINSTAAPP, I’m interested to see how the new crop fares. Anyone here play dice baseball, LOL? FWIW, Arrieta’s pitches looked like vomit flying across the plate in Baltimore too! 156—Much less than I’d have expected, if so. Cumberland is good, but it was hard to ever see him having a place in Atlanta. Still loaded up with high-end prospects for August or offseason trades. But I’m probably most looking forward to seeing Touki in the bullpen down the stretch. EDIT: Encarnacion in the deal, too. That’s significant. Still like the deal, though. SECOND EDIT: And getting O’Day, too. Nice. except that we gonna have to pay this guy who has loosing record 8 mil for the next 2 years .. and we have guys in AAA that can do that for league minimum ………. and for a team that has no money to spend ..we finally get to a year where we are gonna have money in 2019 and we have to guy this guy 8 mil of it … bad move …..
Now Tad is super concerned about budget management! Tad – as a gentle reminder, teams are under no obligation to renew the contracts of arbitration-eligible players. Also it’s ‘losing’ and not ‘loosing’, as in, I’m losing my patience with your idiotic posts. Gausman is definitely less of a get than Archer, but then again the Braves gave up zero prospects of note whereas the Pirates gave up two pretty good assets. I’ll be curious to watch Gausman pitch; not sure I have before. 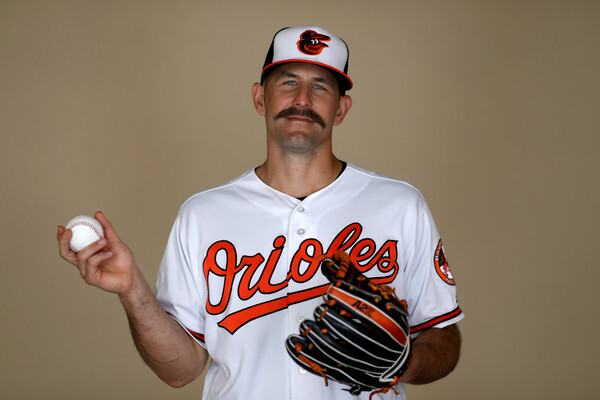 Darren O’Day is a good get. One of the better middle relievers there is. Darren O’Day coming back too. Encarnacion is tough, but this is a Big(TM) Trade, no matter how you slice it. Who cares about the money? Tad is suddenly now super concerned with us saying within our payroll? What a joke! Oh boy, Darren O’Day. You guys want to see a real mustache? Uhhhh, the Braves better be getting some money back. O’Day is making $9M each of the next 2 seasons. @176 that explains the mediocre prospects to the O’s. Will ODay pitch again this year? I thought he had a hamstring injury. AA did exactly what he said he’d do: he markedly improved the team’s bullpen and 25-man roster while giving up relatively little of the team’s farm depth. Right now, JCE is Duvall 7 years younger. You know Thoppy pulled off a complete friggin’ magic trick when the concern-trolls are already down to complaining about payroll to Darren O’Day. I believe O’Day is out for the year (according to BRef). He is under contract through 2019. Yeah, O’Day is a (good!) 2019 play. His mustache is not injured, and that’s somethin. Someone dumped salary on *us* for a change. Don’t know how to react!? Help. I am satisfied, AA. Hope it all works. Oh whoops, had no idea about O’Day. I better get my pitchfork. I called O’Day a month ago. LOL. I think it best to ignore the loose cannon that is tad. If he’s injured, the salary’s covered by insurance anyways, right?! I would have liked a guy like deGrom, but there weren’t any of those out there. We upgraded the team and gave up very little. there goes our money we had to get a 3rd baseman or Catcher or front line starter next year …..
Tad @134 – so you say that it’s not a bad trade then. The Phillies got Ramos for nothing. Wow. What the hell is Tad even talking about? @199 I think he means that between Gausman and O’Day, the Braves have committed $18 million to these two in 2019. Is Tad wrong though? It looks like we took on considerable money to keep the prospect return minimized. Where I differ with Tad is that I don’t give two shits about the money. STP revenue allows us to increase payroll a lot. Save the whining until early next year if we don’t make any offseason signings of note. How much is Kazmir getting from us this year? So who gets bumped from the rotation? @202, almost $18m. $40m between him and Adrian Gonzalez. We will have money. So the O’Day part was a salary dump pure and simple. I am thrilled that Liberty let some money loose (not lose…. LOL). I’d rather them spend money than give away talent. We were all expecting to lose (yes, lose, not loose) Gohara or some top 10 prospect and the highest prospect we lost was #14 JCE. Phillips was not going to get a chance here. Zimmerman is good but not top 30. Cumberland doesn’t really have a position and will do better in the American League. Instead we’re paying, what, $5M this year and $18M next year with $9M in guaranteed money. We now have four players with guaranteed money for next year (Freeman, Teheran, Inciarte, O’Day). That will not in any way put a crimp in what we have available to spend next year. In fact, if we trade Teheran, which seems like an imperative at this point, we could recoup most of O’Day’s payroll space. If he can stay healthy next year, O’Day will be as good as a one year rental. An expensive one, yes, but one with potential to be an elite set-up man. He is next year’s McCarthy. Or he can be traded for salary relief over the winter. And we still have our first 13 top prospects still intact. And 28/30. How could we have done better? And we will not send Fried to the bullpen. That would be cause for sharpening the pitchforks. Either Teheran or Sanchez or both will go to the pen. Moylan better be outta here, too. Gausman is a legit #3 with #2 upside. New rotation is Folty, Newk, Gausman, Fried, Allard/Teheran/Sanchez/other AAA callups. But we’re gonna roll with six SP for a while anyway. I think we’re going to go with a 6-man rotation until the end of the season. I agree we shouldn’t worry about impact on 2019 payroll yet. These trades were made for this season. Once AA is finished with off season moves, half these guys may be gone. Don’ t worry about it. Braves also gave up $2.5M in international money. Giving up Phillips saves another 40-man spot…. for Touki? 6-man is the right move. Really don’t like paying O’Day $11M for his age-36 season coming off an injury. Makes the minimal prospect outlay much less enjoyable; we paid for it. @213 Are you counting the rest of his salary this year to arrive at that $11M? He’s good, and it’s a hamstring. And it’s only $8 million in 2019.
it is not a great comp player-for-player (esp. as Dempster was way more established than Archer & in his age-35 season), but in terms of feeling (like, ‘we whiffed on the ace & who the crap is this guy we got instead?’), missing out on Archer for Gausman feels a little bit like when we didn’t land Ryan Dempster & instead got Paul Maholm at the 2012 deadline. Dempster had been super hot before the deadline but then fell off hugely (5+ ERA) down the stretch with Texas, while Maholm was perfectly cromulent for us the rest of the year before a middling 2013. so, for folks bummed re: Archer, who knows, perhaps? I actutally don’t get the trade with the Orioles. O’Day is not playing and we gave 2.5 million in pool money. Seems like a lot for one mediocre pitcher. I know we cant use the money but it just seems steep. Meh move but what do I really know. so we’ll send him to Rome. Yeah, it’s the remaining salary this season that you have to bake into the cake. We assumed 2 months of salary that we have no expectation of using. I’m perfectly fine with blaming all of Gausman’s struggles on Roger McDowell and the loss of his pitching coaches who had him pitching well. This deal has good potential to pay off — not going to say he’ll explode into Jake Arrieta, but a lot of Orioles fans saw in Gausman a chance to finally have the guy they missed out on. 219—But that’s basically meaningless. It’s only money, prevents nothing, etc. And I’ll be surprised if $8 million next year (and $1 million in both 2022 and 2023) affects any other moves whatsoever. Did you hate it when they paid Bronson Arroyo’s salary to get Touki? @219 When Mike Hampton was hurt, it was made known that the Braves were being reimbursed by insurance to help with the limited budget. Do we assume that is not the case wit O’Day’s remaining salary this year? @223 – love it. I remember a helicopter scene as well, I think? Why would they accept the throw-in for O’Day if it was going to hamstring (ha ha) us next year? It wouldn’t make any sense. Assuming that this deal ruins everything in that regard is just silly. Also, there’s no quicker way to get my eyes to roll into the back of my head than to complain about how much money a deal cost us. I literally could not care less. It’s their job to spend however much money it takes to make the team competitive. AA was on the radio a while ago and said that they have some things from the “R&D / analytics” department to suggest to Glausman and they think they can help. That’s what I like to hear. It may or may not work out, but there’s a plan, and logic behind the plan. By the way, the weather tonight in the Atlanta area is ugly with a capital U. It could eventually clear up somewhat tonight, but I’d be very surprised if this game didn’t start with a delay. Also, the forecast is equally bad for tomorrow night. If we play tonight it’s going to be late, start time around 10pm I’d guess. We only have two off-days this month and one of them is right before a double header in Washington. They will have to try to get these Marlins games in somehow. We may be in for some midnight ball this week. Key question to ask about O’Day is what kind of WARM will he provide next year. Obviously WARM is Wins Above Replacement Mustache. Is Ron Mahay still around? No, definitely not… then. In my mind, I thought we were past that. I thought we were at a point where they would prioritize the capital towards only what was going to help us compete in the present. That we wouldn’t buy prospects or things like that. At worst, we would do something like the Nats are doing where they trade off rentals in a year where star players underperform and injuries and other unforeseens and unavoidables derail the season. With that said, while I’d rather have used O’Day’s 2018 commitment towards a player who can actually help, even O’Day at $11M next year (if you look at it that way) is palpable. But no matter how you slice it, you clearly see that the Braves bought low really well on every single acquisition, and that’s smart on AA. There is an expectation that we’ll see better overall numbers (like OPS and ERA) on every player we’ve acquired. Still questioning AA? Still questioning that the team is not spending money? We will never be as rich as the Phillies, but these trades show their commitment toward the team. I’d say he’s already a 3.0 WARM. That’s a much, much improved roster. @235 Uhhh… I have reason to suspect that in about 9 years, the Braves could eclipse the Phillies. Reason: The Braves could return to having their own sports network (something akin to the Yankees), and we all know the Braves are way more popular than the Phillies. The Phillies may have just won the division with their acquisition of Ramos (if he finishes the season healthy and whatnot). That was the biggest upgrade in our division by far. We seems marginally better on paper now. The teams we’re competing against all did more (save the Gnats). The Pirates are balls-to-the-wall all-in, which is maybe a bit crazy, but also pretty cool given how they’ve historically treated their fanbase. At least we can all agree that it’s good to not be the Mets. I’m sorry if it seems like I’m complaining. Not my intent. According to Stu’s spreadsheet, with even generous arb raises, the team as currently constructed will cost a max of $75M IMO. And they’ll need a RF, two C, one SP, and one RP unless filled internally. If they even get to their 2017 paid payroll ($121M), then that’s… a lot of cheddar. @238. I can’t see beyond 2 years, not to mention 9, hahhaa. Great day today honestly. I don’t get Tad’s pessimism at O’Day. He will be super useful next year. Especially the fact that we will not have a super expensive closer, an expensive and a very good middle reliever is something we can definitely afford. I also believe that we will trade Teheran in this offseason.! @240 We shouldn’t have to look outside the system for a starting pitcher for a long time. Newk/Folty/Gausman/Teheran/Soroka or Tokyo or one of a thousand arms at AAA. They’ll need a RF and a catcher. If he finishes the year strong, my opening day 2019 starter is Newcomb. Watching the Paul Byrd interview for the first time just now I was delighted to hear Chipper say among the things he was most proud of was he’d played his entire career as a Brave. Maddux was never in a position to say that but the other two were and chose not to, chasing the biggest buck to the end. I remember clearly the disappointment i felt at the time. One other Chipper memory from the other extreme of his time. Watching his first ST at bat and shredding his foot on the bag at first base running out a ground ball, hard. He took the last pitch i was ever able to watch at Turner Field at the end of a game with Giants where we were way behind in a meaningless game. I had started on my way out from the upper bleachers but turned when i heard his name called. Maybe, may be he’ll hit this out for me. And he did, left handed, opposite field. This thread was getting a little thick. New thread. gNats taking out their frustrations on Matz… er… Mets…. er… MAtz. @245 If he finishes the year strong, my first trade in the offseason is Teheran. OK, even if he doesn’t finish the year strong. We are at a point where we no longer need to sell high on Teheran, just sell. After aggressively promoting Wright and Touki and Wilson, there will be no possibility of a shortage of SP candidates next year. Trade Teheran; let McCarthy and Sanchez go. Release Flaherty. After that sign Harper and trade for Realmuto. Promote Riley. Bench is Duvall, Culberson, Camargo, and backup C (sign Flowers). Let Minter close. O’Day/Brach/Winkler/Biddle/Venters/Viz/Carle in the pen. If Brach is too expensive; use that slot to rotate fresh arms through. Rotation is Folty/Newk/Gausman/Fried/Soroka. Allard/Touki/Wright/Wilson would be first up for injury (two of those arms would be used in a Realmuto trade). We will come in under budget with a championship roster. Next post Trade Deadline Recap – Venters, Brach, Duvall, Gausman, O’Day… Oh My!